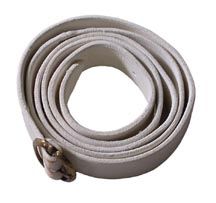 Has a white leather flap with a russet pouch and a white strap that is 2 5/8" wide with correct #53 double tongue buckles. Also has two sheaths for vent picks. The strap is included.